You can also purchase this in other colors to help you identifiy various job roles at a glance. This feels like it is strong and made from high quality polyester or something, and the steel clip is strong as well. Recommending this to all of you out there. 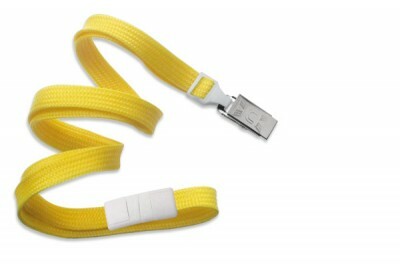 Our previous lanyards did not come with release clasps, this ones do. Get this to promote safety in schools. We started with buying lanyards in different colors to help us identify departments but now we want them customized with job roles to further make it easy to distinguish people. The other store where I usually buy lanyards did not have this in stock. This costs just a little bit higher here but after browsing the reviews, this ID store seems trustworthy enough, so I tried it out. Not disappointed so far but hope they could lower the price even further.